When art directing the opening part of the adventure, set on our alien homeworld, I wanted to make sure to create an environment that would contrast strongly with the shadow world. I used soft and earthy colors, and restrained myself to not go too weird on the vegetation, as I wanted to keep the really strange stuff for later on. 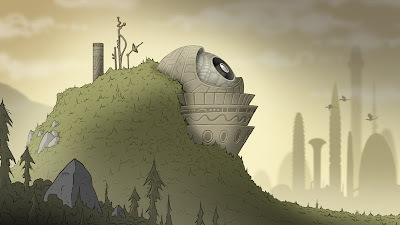 This image shows the homebase/observatory where our alien hero observes the shadow planet, keeps his equipment, and builds his ship. It looks like a great contrast to everything you've shown so far. Excellent work Michel. Man I cannot wait to play this game. Any idea what platform it will be on?